Our attention tends to be biased towards emotion. We will tend to pay attention to information that is conveyed with emotion more quickly and more often than we will pay attention to the same information delivered in neutral tones. This is a simple matter of brain hardwiring.This is partially why we find it so hard to do something that we know that we “should” if we don’t feel strongly about it. We’re wired to pay attention to emotion first. The first step we take in building a viewpoint about any information is to select that information from the world around us. What is significant from a coaching standpoint is that we will tend to pay attention to information with emotional significance first. Which can mean that our perceptions about any particular event are more likely to be charged with some degree of emotion. We will have an opinion, a feeling, a reaction. Ever notice how difficult it is to think objectively and dispassionately about something? It often takes an active effort on our part. This just means that within a coaching situation it is important to keep this emotional bias in mind as we explore the worldviews involved. It may or may not have significance in any given situation . . . but it will be there. And our understanding of that fact can help us as we address inconsistencies or other self-defeating processes within a particular viewpoint. Replacement behaviors, strategies, and so forth are most likely to get attention if they have emotional content that is at least as strong as that which they’re attempting to replace. “Giving is the most potent force on the planet … and will protect you your whole life,” says Steven Post, a bioethicist at Case Western Reserve University in Cleveland and head of the Institute for Research on Unlimited Love (IRUL). Far from being a metaphysical think tank, the Institute sponsors multidisciplinary research studies that are part of a growing paradigm-shift among scientists beginning to contextualize health within a broader framework. IRUL research is part of a significant shift under way within key scientific disciplines from focusing just on the deficit or disease model of human nature to studying the positive, virtuous, and thriving aspects. In the process, the research is broadening the understanding of what contributes to health and longevity. So says a recent article in the Christian Science Monitor. Over 50 multidisciplinary studies of altruism have been sponsored by the Institute. And their work builds upon at least a decade of over 500 such studies by other organizations. Post emphasizes that the empirical evidence demonstrates that it is the feelings behind the acts rather than the mere activities themselves that benefit participants. (See also Paying Taxes makes me Feel Good?) Giving promotes beneficial neurological processes that are a natural part of healthy brain activity. And apparently, it may also play a natural part in our overall health and well-being. What memories are made of, at least at the cellular level, has been visualized for the first time by a team of scientists at the University of California at Irvine. Changes in the size and shape of synapses, the connections between neurons, store our memories. This both verifies recent thinking and opens the way to map the storage of memory across the entire brain. The research has important implications for the management of memory-related disease and other disorders. Maybe you’re the type of person who likes to do things on their own. Or perhaps you don’t want to try and weed through the numbers and styles of the already 50,000+ (and growing) life coaches currently practicing. A new book, Every Day Matters: How You Can Improve Your Life in 7 Weeks or Less, offers readers practical advice based on time-tested research and insights drawn from Dr. Agata Dulnik’s own coaching experience. “This is not a book about commiserating. This is a book about providing solutions by offering a uniquely simple-to-follow process that is quick to learn and incorporate into every day life,” she says. Self-coaching isn’t necessarily for everyone. But even if you pick up just a tip or two it might be well worth a read. Research from the University of Michigan Health System suggests that individuals who respond to placebos have significantly more dopamine activity in a specific portion of their brains than those who do not. The dopamine activity seems to be proportional to the amount of benefit that the individual anticipates. This anticipatory aspect is interesting from a coaching perspective. Anticipation of a benefit is based upon trust in the source, which in coaching is based upon relationship. In a coaching relationship the trust factor has significant influence on whether an individual will consider the coach’s advice. In a good relationship he or she will be open to trying the coaching suggestions, even if they seem counter-intuitive to what the individual thinks or feels. This study suggests that in a good coaching relationship, the expectation of a benefit (say, for instance, relief from being ignored due to poor social skills) may cause the release of dopamine and make the coaching recipient feel better as they go about the process of following the advice. And this increases its chances of success. Events filled with emotion are more likely to capture our attention. The media has known this for a long time of course. And we know that we pay more attention when spouses finally become angry and yell after we’ve found ourselves only half listening to what they say. We are not passive observers of the world. To some degree we choose what we see (or our brains do it for us), and then we give it significance according to the well-known “ladder of perception” model. We’ve all experienced the heightened awareness that we have of an event when we feel truly emotional about it. These findings suggest that our perceptual systems are exquisitely tuned to the occurrence of emotionally significant stimulus events, requiring much less attention or effort to reach conscious awareness compared to events of neutral value. In other words, out attention is biased to pay more attention when emotion is involved. Motivational speakers know it. Preachers know it. Good teachers know it. Coaches need to know it as well. A little bit of passion can go a long way. I have long remembered something that was said to me some years ago in the midst of an emotional turmoil at the time – “People will forget what you say to them. They will never forget how you make them feel.” I’ve found that to be true over the years. I’m not particularly superstitious, so this day doesn’t cause me undue angst. Nevertheless, I still find myself thinking about it due to the general chatter in the media, at the office water cooler, and so forth. And despite my disbelief, it’s still hard not to think about it, at least momentarily, if something goes wrong. I find that I have to mentally reaffirm that I think it’s just coincidental. That’s my personal mental model. Now, a University of Oregon study indicates that people on average can retain only four items in active memory at once. Whatever the number, the clarity with which items can be remembered varies from person to person. And even the people who can remember more items do not necessarily remember them more precisely. Now I have a new reason to forget about this day. 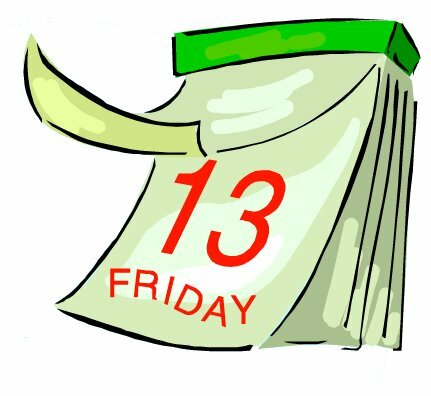 If I have to remember that it’s Friday the thirteenth does it follow that I can only keep three other items in my memory? Being that’s it’s hard enough to remember things as it is, this adds fuel to my mental-model fire if you will. For more on this memory study (without the thirteenth hoopla), check out this link.